Navajo Owners: Enhance Your Investment! You have made a substantial investment in the purchase of your Navajo. Upgrading it with our ULTRAcooling System will enhance your investment and you’ll save money by flying fewer hours, which will more than pay for the upgrade during a typical TBO period. And, ULTRAcooling willl continue paying dividends in improved performance, increased efficiency, greater safety, and lower maintenance costs. Plus, it will increase the resale value of your Navajo. With no intercooling system installed, compressor discharge temperatures and servo inlet temperatures were as high as 250F. With the American ULTRAcooling system, those temperatures are reduced to about 85F making full rated H.P. available at typical cruise altitudes. Because your engines are turbocharged. While turbochargers do allow your engines to produce more power and maintain manifold pressures at altitude, they also produce very hot induction air. This compressed induction air can get as hot as 300 degrees F even though the outside air temperature may be at or below zero. Both Teledyne Continental and Textron Lycoming Pilot Operating Handbooks state that the horsepower of a turbocharged engine is reduced as the engine ingests hotter than standard day induction air. The effect on your engines is identical to the poor performance you experience on a small aircraft when the carburetor heat is applied, or when operating on a hot day. That’s where ULTRAcooling comes in. ULTRAcooling is a highly efficient air to air heat transfer system that reduces the compressed induction air temperature, restoring the engine’s lost power and efficiency. In other words when Ultracooling is added to a turbocharging system, the engine is able to more closely maintain its rated horsepower. The key to ULTRAcooling performance is its fully integrated, multicomponent design. The System is comprised of three major assemblies; (1) A custom designed, high efficiency aluminium alloy heat exchanger designed to cool the heated compressed induction air using the colder outside air. (2) An aerodynamically engineered P-51 style scoop positioned to maximize the recovery of ram air velocity from the propeller. This provides maximum high pressure cooling air to the heat exchanger core at all power settings and flight conditions, resulting in near constant inlet temperatures and power output at all altitudes. (3) High flow induction manifolding, for transferring induction air throughout the system. Our aeronautical design engineers were careful to design each component to perfectly interact with one another to ensure optimum performance and reliability. The benefits of our ULTRAcooling System extend throughout the entire spectrum of aircraft performance. ULTRAcooling dramatically improves hotter than standard day operation, higher than sea level takeoffs, single engine operation, engine temperatures, and fuel efficiency. Plus, you’ll have the advantages of extended range, improved twin engine climb rates, and higher cruising speeds. Since your aircraft’s intercooler was designed more than 30 years ago and by today’s standards it is relatively ineffective, we specifically developed an ULTRAcooling System for the Navajo. 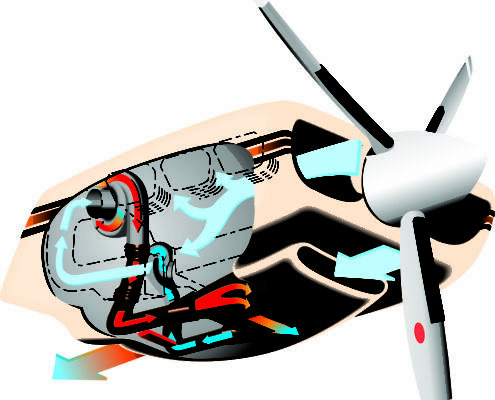 Nearly all modern turbocharged aircraft engines are also factory intercooled. The Piper Malibu, Mirage, Mojave, Seneca V, and Aerostar 700P, the Beechcraft Baron 58P, The Cessna P210, 414 and 421, the Mooney 252, TLS and Encore are all equipped with factory-installed intercooling systems. If Navajos were in production today, intercooling would certainly be standard equipment. Now the evolution of intercooling technology has taken a giant step forward with the introduction of American Aviation’s Turbo ULTRAcooling System. 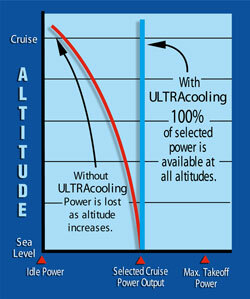 ULTRAcooling is a highly sophisticated advancement of the basic intercooling concept, resulting in optimized aircraft performance.